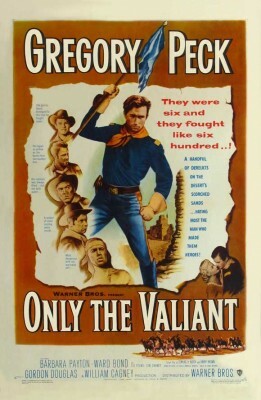 Star Gregory Peck regarded Only the Valiant (1951) as the least favorite among his starring films, a surprise considering he certainly made worse movies (Duel in the Sun and Mackenna's Gold, for example) and because Only the Valiant is actually pretty good, though technically sloppy and generally unoriginal. The basic premise, a tiny contingent of bitter, squabbling U.S. Cavalrymen trying to maintain military discipline while hopelessly outnumbered by bloodthirsty Apache Indians, is similar to the later (and much better) Zulu (1964). However, Only the Valiant's good qualities outweigh the bad and overall it's well above average. The movie is yet another Warner Bros. release now owned by Paramount, which in turned licensed it for home video to Olive Films. William Cagney, James Cagney's younger, look-alike brother produced Only the Valiant independently, which Warner Bros. merely distributed. William had produced some of his older brother's films (Blood on the Sun, The Time of Your Life, etc. ), with Only the Valiant originally conceived for James Cagney and most of the Time of Your Life cast. The high-def transfer shows its age with a lot of speckling and other minor blemishes, particularly at the end of reels, but otherwise this full-frame, black-and-white production looks quite nice. The movie very wisely opens with a map, lingering on the spatial relationships among Ft. Invincible, a small New Mexico Territory outpost guarding a razor-thin pass on which the other side is hostile Apache Indian country. Behind the outpost is a barren desert, with the much larger, better fortified but still vulnerable Ft. Winston some distance beyond. Capt. Richard Lance (Gregory Peck), civilian Indian scout Joe Harmony (Jeff Corey) and some others arrive at Ft. Invincible just after a massacre that's left everyone dead and the outpost severely damaged. Apache leader Tucsos (Michael Ansara) is captured, but rather than take Harmony's advice and execute him on the spot, Lance insists on taking him back to Ft. Winston for questioning. Commanding officer Col. Drumm, seriously ill following a stroke, wants Tucsos moved to Ft. Grant. However, even this is a suicide mission, so Lance assigns himself the task of leading the detail. A love triangle is introduced between Lance, Cathy Eversham (Barbara Payton), a captain's daughter, and Lt. Bill Holloway (Gig Young). Lance and Cathy passionately embrace but he later catches her kissing Holloway, whose proposal of marriage she's just refused because she loves Lance. Col. Drumm, meanwhile, having learned of Lance's plans to lead the detail, countermands Lance's orders, assigning Holloway to the task instead because Lance is needed at Ft. Winston. Naturally, everyone assumes these new orders are not the colonel's but Lance's, a convenient way of disposing of his rival. Sure enough, Apaches rescue Tucsos and kill Holloway, deepening already seething resentment by various Cavalrymen against Lance. Further, Tucsos is now armed with invaluable information about the fort's limited defenses. Lance proposes a desperate plan to hold off the Apaches for the two days or so needed until an anticipated relief column of 400 soldiers arrive: an eight-man patrol taking a stand against hundreds of Apaches at Ft. Invincible. Except for scout Harmony and nearly useless officer Lt. Jerry Winters, who's dying of tuberculosis, Lance surprisingly chooses the men who hate him most: Corp. Timothy Gilchrist (Ward Bond), a loud Irish drunk; Sgt. Ben Murdock (Neville Brand), a bully who resents Lance for obstructing his promotion in rank; Kebussyan (Lon Chaney, Jr.), mad Arab with superhuman strength; Onstot (Steve Brodie), a former Confederate soldier and deserter; Trooper Rutledge (Warner Anderson), who for mysterious reasons wants Lance dead; and Saxton (Terry Kilburn), a green soldier and a coward. Short on water (the cistern is dry) and with everyone fearing they're going to die, Lance struggles to maintain order while nervously lighting up the pass and strategically positioning dynamite, hoping that will give them the edge they so desperately need. Only the Valiant is the geographic inverse of Zulu, where a small contingent of British troops is totally surrounded by thousands of Zulus plainly visible on hilly but open countryside. Here, the imbalance of men is similar but the narrow pass keeps the Indian threat in the deep, dark shadows of the mountain. All this generates considerable suspense and the movie is pretty brutal by early 1950s standards. However, much of this tension is undone by surprising sloppiness on the production end of things. Almost the entire film, including the exteriors of the two forts and the pass itself, are expansive but obvious soundstage sets with painted backdrops. The lighting isn't very good, either. The "sun" casts multiple shadows and the shadow of the microphone boom is also visible in a shot or two. In other scenes, the actors stand in front of process screens. The acting is also variable. Ward Bond seems to be auditioning for The Quiet Man, or maybe he's just imitating Victor McLaglen from John Ford's Cavalry films, but he and his Irish brogue are outrageously over the top. Lon Chaney, bearded and, like Ahab, is referred to by all as the "Ay-rab," playing his scenes with the same wild-eyed intensely as Lawrence Talbot transforming into the Wolf Man. Conversely, Jeff Corey is superb as Holloway, giving by far the film's best performance. His Indian scout is totally authentic without being "colorful," the way such parts are usually played. All of his scenes with Peck are memorable. Sadly, Corey would be blacklisted for 12 years soon after this was released. One scene teams liberal Peck, former Communist Corey, and anticommunist reactionary Bond. I wonder if politics ever came up. The movie is also notable as one of Barbara Payton's few big studio projects before her career instantly derailed after actors Franchot Tone and Tom Neal fought for her affections and Tone was nearly beaten to death by Neal. (Neal subsequently beat his wife to death and went to jail.) Payton, also seriously injured by Neal in the brawl, suffered the most. Only the Valiant had been a high-profile release, yet before the year was out she was all but banished to Poverty Row and starring in Bride of the Gorilla (which also starred Chaney, whose drinking was destroying his career). Payton was fooling around with the married Peck during the making of Only the Valiant (he never denied it, apparently), and that may explain some of his later distaste for the film, but Payton herself gives the weak part a good performance. Only the Valiant is on the worn and speckled side, but much of the time impressively sharp with decent blacks and contrast. The DTS-HD Master Audio mono (English only) is likewise perfectly fine. There are no subtitle options, and no Extra Features. A seriously flawed but still above-average Western, Only the Valiant is Highly Recommended.